While googling "Titans" of Greek mythology the other day I came across an odd time travel reference a French comic/series called - Mickey à travers les siècles (aka Mickey Through the Centuries). The stories featured Mickey Mouse as a time traveller. 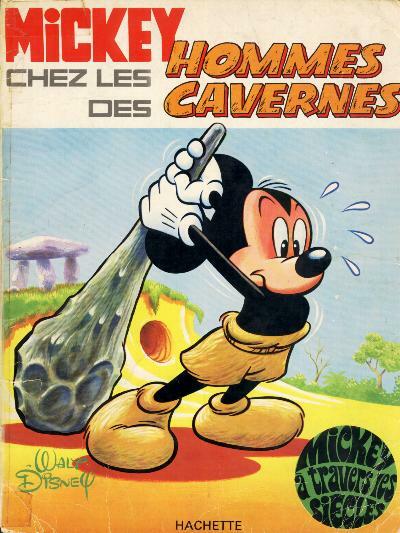 From what little I can gather the series ran from 1952 to 1970 as part of a larger Mickey Mouse comic. In 1970 it appears to have gotten its own comic which continued until 1978. Here's one link to a list of the various series and the historical characters that appear in each one. It also lists whether or not the series was historically faithful for a particular time period. No word on whether he owned a time machine or just simply showed up in each of these time periods unexplained. Anyone ever read/own one of these issues? One of the reasons I started Andy's Anachronisms was to discover new sources of time travel material to enjoy. When I say "new" I mean new to me, not necessarily new to the world. 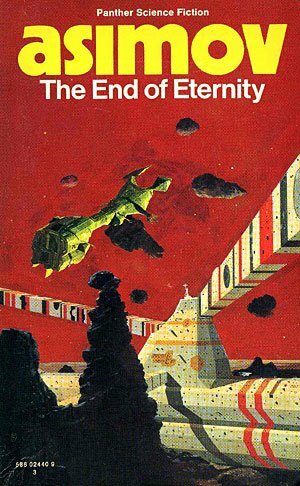 Thanks to the website io9.com for the heads up that Asmiov's 1955 novel The End of Eternity is being made into a movie. Currently attached to direct is Kevin MacDonald (Last King of Scotland, State of Play, Touching the Void). The novel focuses on a group of time travellers working for an organization called Eternity. They travel the time stream modifying events and change reality to minimize the impact on humans. The reasons for their existence and whether or not they are doing more harm than good become the focus of the novel from what I understand. I'll definitely keep an eye out for a copy of the original novel, and look forward to how it might translate to the big screen. Horror and time travel sound like an unlikely pairing that shouldn't be able to co-exist, but they manage to do just that in Nacho Vigalondo's 2006 debut Los cronocrímenes aka Timecrimes. Featured at a number of festivals in 2007 and after receiving a small theatrical release in December 2008, the film was released on DVD this past week. I rented it this weekend and just finished watching a little more than an hour ago. It's an interesting take on Heinlein's By His Bootstraps and without giving away too much the film folds a couple of timelines back on itself. The logic of the timeline gets a bit muddled for me near the end, but what I really enjoyed was the transition of the main character Hector over the course of the film. Hector and his wife are living at a house in the country where Hector seems to be recovering from something stress-related. He comes off as timid and frazzled by everything around him. When Hector witnesses a young woman disrobing in the woods through his binoculars he goes to investigate. Hector finds the unconscious girl, only to be stabbed by an unknown assailant whose face is obscured by a pink bandage. Hector flees from the man only to take refuge in a facility where a lone operator is experimenting with a time machine. Hiding in the time machine Hector is sent back in time an hour and change setting in motion a vicious cycle. The tagline on the DVD is "The Future is Never the Same Twice" an appropriate sentimen given the twists the film takes. I'll be giving it some more thought over the next few days before I attempt to write up a more thorough review. It's interesting to note that this movie has been picked up by Hollywood for a remake, should be interesting to see where they go with it. For now I'll recommend the movie more for the time travel aficionado out there or someone looking for something different. If movies like Primer and Donnie Darko make your head hurt, then this movie is probably not for you. *Note: The movie is in Spanish, but the disc I rented defaulted to the English Dub. I had to stop the movie and change the setup to get the original Spanish dialogue and English Subtitles. You may prefer the dubbing, but I much rather read subtitles and listen to the original performances rather than some sub par voice actors reading the dialogue. I have a bad habit of getting excited about the release of a new time travel movie then never getting around to watching or reviewing it. Back in 2006 I was excited when I first saw the trailers for Deja Vu featuring Denzel Washington as an Federal ATF agent investigating a domestic terrorist accident with the aid of some very high tech time travel related gear. Fast forward to March 2007 when the movie was released to DVD, I bought the day it came out. You think I would have watched that weekend. Nope. One thing lead to another and it sat on my shelf until tonight. It wasn't for the lack of trying. I must have lugged that DVD on every trip I have been on in the last two years thinking I would get a chance to watch it on vacation. Anyhow enough about my natural tendency to procrastinate. Or was I delayed in watching it because I wasn't destined to watch until tonight. Hmmmm. As with any time travel movie, Deja Vu has a tendency to leave you scratching your head at times. I followed a long well enough, or so I think. It's definitely no Donnie Darko or Primer when it comes to "Huh?" moments, but its still out there on the edge. I've got a soft spot for time travel stories that rely on remote viewing of sorts to travel to the past. I think its a much more believable method of time travel than sending object or people to the past. Having said that the movie does shift tone a bit in the final act of the story and I think that's where most people had problems with it when it first came out. I'll be reviewing this in more detail on the site in the near future. Would love to hear other people's thoughts on the movie. 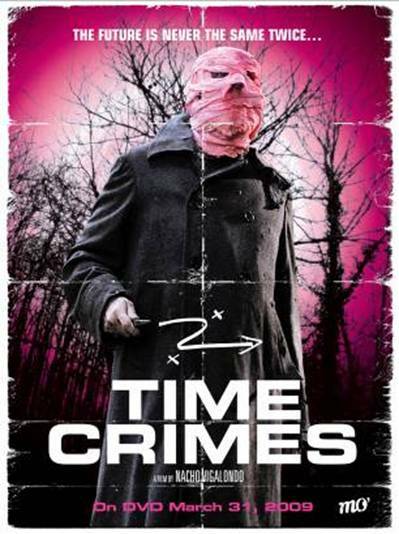 I also have a copy of Timecrimes on my desk that was just released this past week that I need to watch before tomorrow night as well. Too many time travel movies, never enough time. Jack Finney - Time and Again a good read. Jack Finney (1911-1995) is one of those rare writers that succeed at every genre they attempt. Finney got his start in the late 1940s and early1950s writing mystery and crime stories for such magazines as Ellery Queen and Collier's. His first novel “Five against the House” (1954) was made into a movie in 1955 starring Guy Madison, Brian Keith and Kim Novak. He also wrote in science fiction during this period successfully publishing a number of time travel short stories such as The Third Level (1950), Such Interesting Neighbors (1951) and I’m Scared (1951). For his second novel Finney produced a thriller with a science fiction edge that you may have heard of - “The Body Snatchers”. The novella was serialized in Collier’s magazine in 1954 before being released as a novel in 1955. It would go on to be adapted as a film in 1956 as “The Invasion of the Body Snatchers” and would eventually be remade three more times - in 1978 as “Invasion of the Body Snatchers”, in 1993 as “Body Snatchers”, and most recently in 2007 as “The Invasion”. 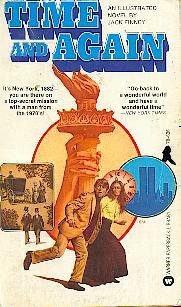 Finney’s most recognized work and one of my favourites is the classic time travel novel “Time and Again” (1970). In it a young advertising executive, Si Morley, who travels back in time to 1882 and visits New York City as part of a government experiment. What makes the novel so remarkable is Finney’s ability make the time period come alive for the reader. Well researched and even more seamlessly told, Finney manages to incorporate historical settings, events and characters into tapestry that becomes 1882. Originally billed as an illustrated novel, the book and subsequent paperback came complete with photographs and sketches of the some of the key scenes and locations in the novel. Whereas most time travel stories use either ‘scientific’ time machines, or some form of mystical/magical phenomenon to transport their protagonists in time, Finney takes a different perspective using hypnosis. He suggests that time is but an illusion that keeps the subject in the present and by immersing Si in the elements of 1880s manages to break down the barriers. It sounds hokey at first, but in the Finney’s hands it is convincing. You almost want to believe Finney was the one that visited past and is simply retelling his own experiences..
Finney followed up the novel twenty-five years later with a sequel “From Time to Time” which was published shortly after Finney’s death in 1995. The sequel again features Si Morely who becomes involved in a plot to prevent World War I and is largely set in 1911. A collection of Finney’s short fiction, most of which involves time travel, has been published as “About Time” in 1986. While some of the stories are dated, Finney’s descriptive prose and concise story telling make them well worth reading. If you haven't read any of his work before Jack Finney is definitely an author to check out. I often get asked whether or not I believe in Time Travel. You think that would be an easy answer for me given the fact that my hobby, as it were, is time travel. Problem is the question is a bit of a loaded one. Seriously, time travel stories, whether it be in movies, on TV, in print, or on your computer screen, allow us to juxtapose different time periods, explore “what if?” scenarios, and to examine the vary nature of time. Yes it can also give you a Grade ‘A’ headache if you think too much about the paradoxes and improbabilities, but that side-effect can be lessened by a skillful storyteller. At Andy’s Anachronisms I’ve tried to highlight some of those superb storytellers that manage to weave a good tale, entertain, and hopefully give you something to think about when its all said and done. Also part of my job has been to put up caution signs around the less than stellar examples of time travel that give the sub-genre a bad name. I’ve been compiling some of my own top ten lists that I plan to post on Andy’s Anachronisms in the coming months. First up will be my “Top Ten Time Travel Movies”. I know it’s bound to be controversial for a number of reasons. For starters I have not seen every time travel film out there – yet. I know I am bound to overlook some gem. Secondly, taste is very subjective. Not everyone is going to agree with what I like, so be it. My advice to anyone who disagrees, get their own blog and post your own Top Ten list or go out and make a time travel movie make my top ten list. In the meantime, I am planning on highlighting some of my favourite time travel authors starting with Jack Finney who will be the focus of my next entry. *When I use the phrase “Time Travel” to describe the sub-genre I am also including its cousins Alternate History and Alternate Universe stories. 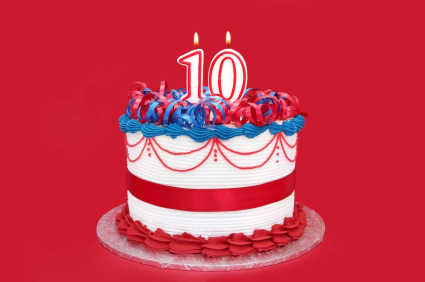 Andy's Anachronisms Celebrates 10 Years! It's hard to believe it was 10 years ago this February that I started Andy's Anachronisms. On one hand 1999 seems like just yesterday while on the other it seems like a lifetime ago. I think that's why I find the subject of time so fascinating and time travel in particular. Our ability to perceive time and ask the "What if?" questions. You can even travel back in time and see an early version of my site via the power of the The Wayback Machine. How appropriate! In ten years time I have posted over 50 movie reviews, nearly 30 book reviews, two dozen plus television reviews, almost 60 short story reviews, and another couple of dozen reviews about toys, songs, and time travel related news. I've had a few outstanding guest contributors over the years, but it largely remains a one man show. The down side of that is there are never enough hours in the day to spend the time I want reading books, watching movies, and writing reviews. In 2009 I plan to make more of an effort to add new material on a regular basis. One of the new additions to the site is this blog. My intention is to post up and coming time travel and alternate history items as well as highlighting new and existing reviews on the site. Whether this is your first visit to Andy's Anachronisms or your 100th I welcome you to the wealth of reviews here and hope you'll keep coming back.